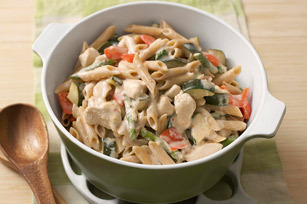 Fresh Spring vegetables taste extra special when tossed with penne pasta and a creamy Parmesan sauce. Meanwhile, heat dressing in large skillet on medium heat. Add chicken and vegetables; cook 10 to 12 min. or until chicken is done, stirring frequently. Add broth and cream cheese product; cook 2 min. or until cream cheese is melted, stirring constantly. Stir in Parmesan. Sprinkle with 2 Tbsp. chopped fresh chives or basil just before serving. Omit chicken. Prepare as directed, cooking vegetables until crisp-tender. Prepare using 5 cups of whatever cut-up vegetables you have on hand. Add vegetables to your family's diet with this creamy colourful meal. As a bonus, the red pepper provides an excellent source of vitamin C.